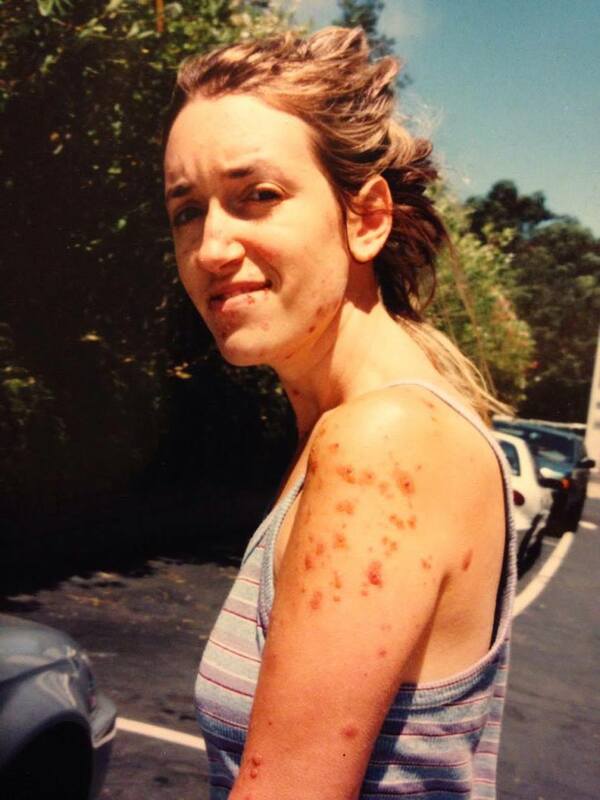 July 2000 after my rash had significantly improved. Where does one start with their personal story? What was the catalyst for your life to head in a different direction? How long was the build up toward that pivot point? What signs did you ignore? Right after I graduated from college, I moved home with my mom and started a job as a Director of an educational tutoring center. I was miserable. It wasn't what I wanted to do. Every day I'd find myself feeling more closed down. More hopeless. Less like myself. It would be an easy out to say just get another job. Do what makes you happy. Follow your bliss. I ascribe to these philosophies now as much as I did then. Except I had no idea what else to do and I felt absolutely trapped by this lack of clarity. As everything is connected, my body expressed what my emotions and mind could not. Clearly, for me, it was time to listen and pay attention in a new way. How can I fix this? How do I heal? I went to a doctor, dermatologist, acupuncturist, nutritionist, live blood cell analyst, and homeopath. Each one gave me a completely different answer as to what was wrong with me and how to fix it. The live blood cell analyst told me what I had was worse than cancer, it was spreading fast, and it would kill me. That practitioner scared me enough that I followed her guidance and ended up in the emergency room. It was a nightmare. But...it taught me one of the most important lessons of my life - DISCERNMENT & TRUST YOUR GUT. Each health practitioner I visited had a different perspective on health and what it takes to heal, different training, and definitely, a different vibe. You get an immediate sense of people, don't you? I know I do. Yet, sometimes we turn off that instinct when we feel scared or unsure, nervous or out of balance. That's what I did. And it landed me in a more compromised position. Continuing to work with the live blood specialist was a no go. Who could help me? There had to be someone. I scanned my mind to think of what other kind of health practitioner I could go to. Once home from the hospital, I flipped through a pile of cards I had recently picked up from a health food store. Homeopath. Something about her card stood out. I didn't know what homeopathy was, or what to expect. Enter a knock at the door, and a fiery redhead in a little black dress with a pile of thick black homeopathic books, and a cheery, "HI!" She sat down on the floor, asking me questions about my symptoms, while flipping through the book pages. Truth is, I didn't say much. She was able to see right through me, in the best of ways. I sat wide eyed as she started telling me what had me feeling stuck, what I was scared of, how I've felt all my life, and how I could turn it all around. I felt like she saw my spirit, the truth of who I was, how I've always wanted to be seen but for whatever reason was too scared to reveal, even to myself. Turns out, not only was she a Homeopath, but also a Psychic. Soon after our meeting, I went to the health food store and got the $8 homeopathic remedy she suggested. Within 30 minutes of taking it, I felt happy. I believe I need to emphasize the importance of this for you. I FELT HAPPY. Though I consider myself a sunshine-y kind of gal, I struggled with depression and felt lost for many years. I still remember, so clearly, standing in front of the bathroom mirror after taking the remedy and seeing myself. Like suddenly, I had reappeared in my own face after having been absent for so long. I was so beside myself for my own return, I kneeled on the carpet, touched my head to the floor, and whispered, "Thank you." The next day, my skin rash started to dry up and go away. It felt like a miracle. That intuitive became my mentor for the next 8 years, shaping my life and the reinvention of it in so many pivotal ways. She taught me how to develop the psychic gift I have, how to better understand the energy or vibe we put out, and essentially how to heal myself. In my lowest moments, she would say "Keep holding on. It will get so much better. You will be surprised at how much so. It's coming. I promise. Just hold on and keep doing your work." I am so grateful for her. As they say, when the student is ready, the teacher appears. As it is with all of life, even when the teachers don't come in the form that you expect. We all have these experiences where it really hits home that something has to change. This was my story. How can I help you transform yours?